5 Steps To A Bigger Stronger Bench! The training program I designed led to a huge increase in my bench press and strength overall. If you read on you will see how you too can increase your overall strength and more importantly your bench! No matter how much we like to think that we leave our ego&apos;s at the door of the gym when its time to workout, we are all guilty of maxing out just to see, "How much we can bench." I for one always liked the idea of being strong enough to throw around some heavy weight in the gym. I feel if the weight is there, we might as well use it. So like any good athlete I set out a plan to increase my strength week by week. Back then my plan was simply to bench away with a particular weight until I achieved a certain number of reps without it being a strain before I moved onto the next weight and repeated the cycle. This method had some (well actually just a little) thought behind it and was effective but very slow to yield results. However, even though it was only slightly effective in aiding the increase in strength it was actually very effective in creating a shoulder injury due to the repetitive nature of my workout. I&apos;m sure everyone has heard the term repetitive strain injury. All the pressing also created imbalances in muscular development in and around my pectoral and deltoid muscles which lead me to re-evaluate my training program. So in order for me to overcome my shoulder injury and rectify my developmental imbalances, I had to breakdown each exercise I was performing, analyze what muscles were being effected, and what muscles were not being targeted throughout my workout. The training program I designed led to a huge increase, not only in my bench press but my strength overall. My bench increased so greatly (40% to be precise) that it lead to me winning a Gold medal at the 2006 World Powerlifting Championships. So if you read on you will see how you too can increase your overall strength and more importantly HOW MUCH YOU BENCH!!!!! The 5 Steps To A Bigger, Stronger Bench! The Rotator Cuffs are a vital muscle group to maximizing your bench, they are responsible for internal and external rotation of the humorous (arm bone) as well as flexion and extension of the arm and also abduction and adduction of the arm. 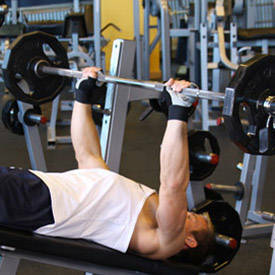 All these movements are intrinsically involved in the actions of the bench press. If we take a moment to think of this and look at the bench press from an analytical perspective - we start the movement with the shoulder joint in the flexed position and also in the adducted position - as we move through the eccentric phase of the exercise we transfer from those positions into the extended and abducted position. Bear in mind that the muscles responsible for these actions are small in comparison to the prime movers of the bench press (pectorals major) and even the assisting muscles, triceps and anterior deltoid. Exercising these rotator cuff muscles will aid in the stabilization of the shoulder joint as a whole, minimizing the risk of injury while also allowing you to control more weight during the performance of the exercise. Strong triceps are also a necessity for having a strong bench; after all they are solely responsible for the "lock out" phase of the movement. Increasing the strength of the triceps through similar movements is a great approach to take when trying to increase the amount of poundage being used. Close-grip bench pressing increases the range of motion of the elbow joint during the "lock out" phase maximizing the number of motor units being utilized to complete the movement, in other words, transferring the emphasis from the pectoral muscles to the triceps. The increased strength gained from performing this exercise transfers perfectly into the traditional bench press because of the biomechanical similarities between the two movements. Decline Bench Press (declination of approx 20 - 30 degrees) allows you to move a larger volume of weight than flat bench, this is due to the biomechanical changes in the range of motion, much like arching the back during the flat bench. This angular change recruits the triceps and deltoids to a greater extent, due to the degree of abduction of the humorous being decreased than that of the flat bench, a greater number of motor units are recruited during the decline movement. 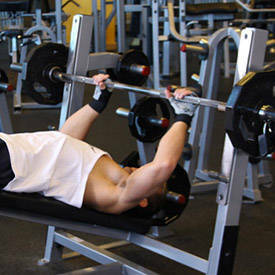 Eccentric Flat Bench Press are of major benefit to one&apos;s strength. A training partner is vital for this phase of your training program. For eccentric training to be truly effective one must have a training partner who is at the same level of strength and is also switched on to one&apos;s capabilities. Here a heavier weight will be used than when performing the regular exercise. 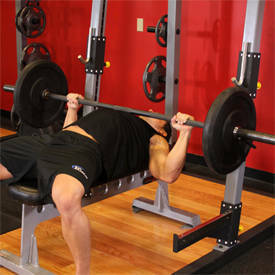 As you lower the bar without aid and under complete control, your training partner should be ready to take up to 75% of the load when going through the concentric or positive phase of the movement, this method helps the muscles to adapt to the increased load in a more progressive manner, and the strength increase transfers to the conventional bench press in a relatively short period of time. Thanks to muscle memory the body realizes that it has already adapted to using such weight, when performing the eccentric or negative phase the muscles brace in anticipation of the load and as they extend they create an elastic like effect, the tension created allows one to press the increased weight under a greater level of control, in other words YOU HAVE GOTTEN STRONGER!!!! Partial Repetitions are the final step in my training program - I stole this method and adapted it from the Weider Principle of 21&apos;s where 7 lower half reps are performed, then 7 upper half reps are performed followed by 7 complete reps. However my adapted method is not as intensive repetition wise, rep ranges are kept between 6 to 8 and sets are performed completing the lower part of the repetition only, that is from the sternum to the midpoint of the movement. When performing the upper part of the movement a block should be used, some like to use a couple of phone books taped together. The bar is lowered from the lock out position to the top of the block and then pressed, this is a complete repetition. So there you go; my steps to developing a bigger stronger bench. So, no more excuses and no more looking at the "big guys" in the gym in awe, it&apos;s time to make a plan, put it in action and find out for yourself, just HOW MUCH YOU CAN BENCH.